You might have already noticed on DavidNews.com monitor one of the latest projects called Fresh Spring. The program has joined our Golden Stage listing 6 days and has been online for already 35 days. There are two things that caught my attention right after opening the website. Firstly, great design - the HYIP admin has paid attention to design details, secondly, it is a HYIP with a standard investment and accrual mechanism. I have re-invested in Fresh Spring $400 and will let you know about the progress of the daily payments. In the meanwhile, let’s take a better look and see what Fresh Spring is offering us. Fresh Spring is a HYIP with company registration certificate issued by Companies House for a company with a name Fresh Spring Water LTD. At the beginning, I couldn’t understand why the home page of this website looks like they are selling water. However, after seeing the company’s name I realized that they offer to invest in drinking water and understood the connection between spring water and this project. The company claims that they cover about 18% of the European market for treated drinking water consumption. Moreover, this program has been designed to attract extra investment for further development of their business and expansion of Fresh Spring in the European treated water market. As I wrote in the previous paragraph, design of the website makes me think that this company is selling water on the web site. I must admit that images used on the home page are fresh and appealing to an eye. Moreover, there is animation effect added while doing hover over the main page image. Most likely the admin has made a design from the scratch. It’s light and minimalistic, which meets my preferences of the web design. However, I would highly recommend creating this website mobile responsive. It works very well on the desktop, but for mobile users, it might be very complicated to browse on this website due to the way it is displayed on gadgets. Except for the mobile issue, all content is well structured and most important information is located on the first page. 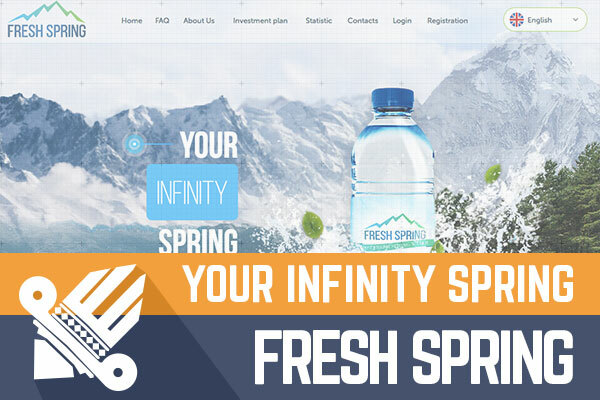 Most likely the admin has decided not to place the calculator on the website because Fresh Spring is offering only one investment plan with fixed interest rate. Fresh Spring accepts deposits starting from $50. I might be repetitive, but such minimum deposit might be too high for some beginners who are willing to try with a few bucks. Most likely there are plenty of users who are ok with such minimum deposit. Fresh Spring is offering fixed interest rate of 3%. Since there is no calculator and it’s important to understand the daily revenue, I’m going to make a calculation for you. For example, $200 deposit will be making $6 a day and will reach the break-even point after 34 days. Only after the 34th day, you will be making a profit because the deposit is locked in forever. Basically, it means that the deposit is included in this interest rate of 3%. The HYIP has been already online for 35 days, which means that it has made one full cycle and guys who invested their money on the very first day will start earning a profit. However, for those who are reading this review, it’s going to take another 34 days to reach the break-even point. It’s a long term and HYIP can go any direction over such time. For those willing to play high stakes, keep in mind that max deposit is $50 000. There are 3 different referral levels for those willing to earn money from it. Referral deposits for the 3rd level will pay 1%, 2nd level – 2% and 1st level – 4%. It’s a standard achievement approach, which will assign you to next level according to your achievements (how many referrals have you attracted) in the program. As can be seen, we have a comparably simple HYIP with one - easy to understand investment plan. No offense to the previously reviewed program, but one plan with fixed interest rate is obviously much easier to understand. Admin has managed to build a simple, but a functional website with a very attractive design, which makes me feel thirsty. However, on the other hand, the minimum deposit of $50 is pretty high. Besides, it would be much easier for mobile users if the website would be responsible, but most likely it has nothing to do with the development of the program. All HYIP’s are highly risky and you are the only person responsible for your investments. Therefore, if you ever decide to make any investments, don’t invest more than you can afford to lose! Investment plans: 3% daily for the unlimited term, initial deposit locked in forever. Automatic payments.